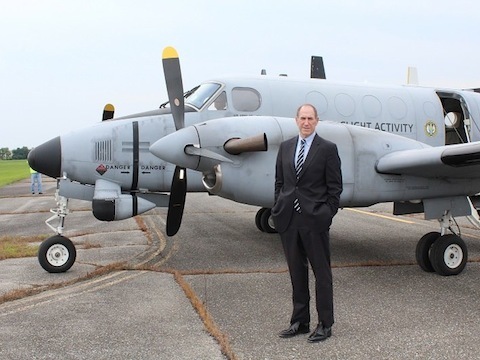 In a combined effort by the U.S. Army, NSA, and the National Cryptologic Museum Foundation, the National Cryptologic Museum (NCM) acquired (Aug 2018) a U.S. Army RC-12D Guardrail reconnaissance aircraft. The aircraft departed Joint Base McGuire-Dix-Lakehurst in New Jersey and arrived at Tipton Airfield near Ft. Meade, Md., where NCM curator Patrick Weadon waited with pen in hand ready to officially take possession of the aircraft. The Army RC-12D will be a welcome addition to the future National Vigilance Park. Plans call for the park to be reestablished with the future Cyber Center for Education and Innovation and National Cryptologic Museum.